Your journey will start at the Royal town of Caernarfon with its mighty fortress built by King Edward the First. Your accommodation will be at the well appointed Bryn Hyfryd Guest House. The town has excellent restaurants. We will meet you at breakfast and issue you with detailed maps and instruct you in the use of a per-programmed GPS unit. Follow the Llŷn Coastal Path along the Menai Strait, past the Nature reserve marshland at Y Foryd and then inland to follow a cycle track and lanes until you reach village of Clynnog Fawr. Clynnog was the traditional assembly point for pilgrims making the journey to Bardsey Island, and contains a fine church, chapel and holy well dedicated to St Beuno . You will be picked up from here and taken to your new accommodation at the Nanhoron Arms Hotel in Nefyn. Options for evening meals include the hotel itself, nearby Indian restaurants, and other inns accessible by taxi. Distance: 22.5km / 14 miles. After breakfast we will pick you up from the Nanhoron and drive you back to Clynnog Fawr. From here you will set out over the high moors at Bwlch Mawr, or along the coast to Trefor. Then continue up over the Yr Eifl Hills. You will then walk down to the village of Llithfaen where you will be picked up and returned to the Nanhoron. Distance: 19km / 12 miles. 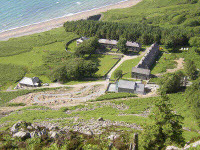 You will be returned to Llithfaen before walking to the coast at the old quarry village of Nant Gwrtheyrn which has been converted to a Welsh Language College and Heritage Centre Continue west along the wooded cliffs until you reach Nefyn where you will be staying the night in the Nanhoron Arms Hotel. Walk west along the coast from the Nanhoron Arms Hotel. This part of the walk includes some fine coastal scenery and the picturesque village of Porth Dinllaen situated right on the beach. Seals are often visible basking on this stretch of coast. At the end of the walking day, head inland through Llangwnnadl to Carrog Farm Bed & Breakfast. This is a farmhouse B&B set among rolling fields where the owner Mrs Thomas can prepare a light supper if required. Distance: 21km / 13 miles. After breakfast, we will return you to the coast to walk around the headland at the tip of the peninsula to Aberdaron itself. This section skirts the elevated headland at the end of the peninsula and offers excellent views both back east as far as the Yr Eifl hills and west across the sea to Bardsey Island. Your accommodation for the night will be at the Ship Hotel, a lively village pub with en suite bedrooms and excellent food. Distance: 18km / 11 miles. If weather conditions are good, take the ferry across to Bardsey Island, or Ynys Enlli in Welsh. Bardsey with its monastery was the destination point for the medieval pilgrimages along the coast of the Llŷn. The monks have now been replaced by a wide variety of seabirds, wild flowers and a thriving colony of seals- sea voyage costs £30 per head giving you 3.5 hours to explore this beautiful island with abundant wildlife. The sea crossing requires calm weather to go ahead as the sea between Bardsey and the mainland can become very rough. If the weather is poor then you could enjoy a well-earned rest day in Aberdaron and visit the beaches and celebrated church of St Hywyn’s. Distance: 32km / 20 miles. Continue eastwards along the coast towards the seaside town of Pwllheli, the principal town on the peninsula. 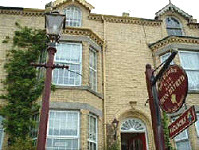 You will spend the night in the Crown Hotel in the centre of town where evening meals are available (all en suite). Distance: 14.5km / 9 miles. Walk from Pwllheli to Criccieth. On your way, you might like to visit the Lloyd George Museum just west of Criccieth. You will have plenty of time to explore this pretty town with its famous ruined castle. Overnight you will be staying at the Gwynle Guest House. All bedrooms are en-suite. After breakfast continue on to Porthmadog, home of the Ffestiniog and Welsh Highland Steam Railways and not far from Portmeirion. This section of the walk will take you across the beautiful expanse of Black Rock sands with stunning views across Cardigan Bay into southern Snowdonia. You will spend the night at the Tudor Lodge Hotel in Porthmadog. Distance: 10km / 6 miles. We will return you to your transport so that you can set off for home. The prices above include bed & breakfast accommodation over 11 nights, minibus transport and use of the maps and GPS and care and attention throughout. Supplement for single occupancy of a room will be £20 per night. Children under 12 sharing a room will be half price. The hotels and guest houses listed in the itinerary may be substituted with other accommodation of equivalent standard if the above are fully booked. For more information, or if you would like to book, please telephone us on +44 (0)1758 760652.